There are two types of reverse charge scenarios provided in law. It is dependent on the nature of supply and/or nature of supplier. This scenario is covered by section 9 (3) of the CGST Act and section 5 (3) of the IGST Act. It is covered by section 9 (4) of the CGST Act, 2017 and section 5 (4) of the IGST Act where taxable supplies by any unregistered person to a registered person is covered. A person who is required to pay tax under reverse charge has to compulsorily register under GST and the threshold limit of Rs. 20 lakhs (Rs. 10 lakhs for special category states except J & K) is not applicable to him. When is GST Reverse Charge Mechanism applicable? If a person not registered under GST supplies Goods or Services to a person who is registered under GST, then in such cases – Reverse Charge Mechanism would get applicable i.e. the GST would be required to be paid by the Registered Person directly to the Govt. on behalf of the supplier. However, in case of supply of exempt goods or services, GST under Reverse Charge Mechanism shall not be applicable. This can be explained with the help of an example. Example: A registered person hires an Auto Rickshaw for commuting from one place to another, then in such cases – Section 9(4) would not be applicable since the transportation of passenger by auto rickshaw is an exempted service. It is pertinent to note here that the provisions of Reverse Charge under Section 9(4) are applicable only for supplies within the same state. The provisions of Reverse Charge under this Section are not applicable to Inter-state supplies as inter-state supplies cannot be made by unregistered suppliers. 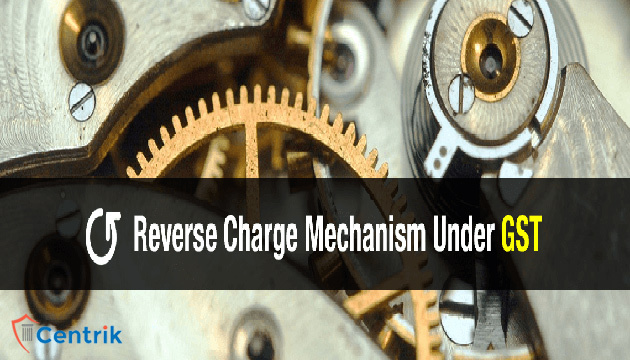 Reverse Charge Mechanism is also applicable on certain goods and services which are notified by the Govt. Reverse Charge under Section 9(3) are applicable for both inter-state as well as same state transactions. The goods and services on which GST shall be levied under the Reverse Charge Mechanism are such as tobacco leaves, silk yarn, and supply of lottery, cashew nuts not shelled or peeled. The Services on which GST shall be levied under Reverse Charge are such as any service supplied by any person who is located in a non-taxable territory, supply of services by a Goods Transport Agency (GTA) etc. All persons procuring goods or services notified u/s 9(3) or section 9(4) of the CGST Act, 2017 are mandatorily required to obtain GST Registration. GST levied under the Reverse Charge mechanism should be deposited with the Govt. by the 20th of the next month. GST paid under the Reverse Charge mechanism would be available for Input Tax Credit if such goods and/or services are used in the furtherance of business. The service recipient (i.e. who pays reverse charge) can avail input tax credit. The details of GST paid under Reverse Charge Mechanism (RCM) would not be auto-populated in the GSTR 2 and these details would be required to be manually furnished. In cases where RCM is levied, the recipient shall raise an Invoice on self. Invoice shall be issued on a daily basis for all consolidated purchases made during the day on which GST is levied under Reverse Charge. At the time of payment to the supplier, the recipient shall also issue a payment voucher for the payment made. Input Tax Credit with the recipient cannot be used for payment of Reverse Charge to the Govt. A registered person will not lose input tax credit of GST paid under Reverse Charge even if the payment is not made within 180 days. Reverse Charge is also applicable to recipients registered under the Composition Scheme. No Credit of RCM is available in such cases. RCM is levied on advance payments as well.